Add additional information about your business to your ads with ad extensions. Ad extensions are additional pieces of information about your business, like a phone number or a link to a specific page on your website, you can add to your ads. Ad extensions are free to add to your ads, with the usual charges for any clicks you get. Including ad extensions can improve the visibility of your ads, which can lead to more clicks and improve your ROI. Why is my ad extension not serving? User signals, like location, device used, etc. Our algorithms optimizes and balances the needs of users, advertisers, and constraints of the search results page. Our algorithms chooses the best layout for each ad by evaluating hundreds of possible combinations based on all available extension data, space allocated, and the positive impact it can provide for advertiser and user. Best practice: Providing extension data allows our algorithms to evaluate all the possible layouts for your ad. It increases the chances of additional space being allocated and increasing clicks for your ad. An account can contain up to 200,000 Sitelink Extensions and can contain up to 150,000 ad extensions of all other types combined. The entity (account, campaign, or ad group) to ad extension association limit varies by the extension type. When you enable a Location Extension, you can choose to show the address of your business location that is closest to the customer and also include a local phone number. Better yet, if the customer is viewing your ad on a smartphone, they can click that number to give you a call. A particularly powerful feature of Location Extensions is that the address shown to the customer is typically the business location that is closest to them. If you have multiple business locations set up for your campaign, Bing Ads will display the address and phone number for the location that is closest to the customer. The radius for the location display is about 50 miles. If you don't have a business location entered that is within 50 miles of the customer, no location will be shown in your ad. In addition to showing your location, Location Extensions also offer iPhone users an easy way to call for a ride to your business from your ad. The Get a Ride feature for Location Extensions is like an annotation, where it could be automatically included and requires no additional set-up. A customer can click the ride icon in your ad that launches the Uber app, and if they are logged in to their Uber account, the destination will be pre-populated with your address. If you want to opt out of Get a Ride, please contact your Account Manager or contact support. Locations that you create apply to all of your campaigns within a particular Customer ID. Also note that you enable Location Extensions at the campaign level and they get applied to all ad groups and ads in the campaign. Ability to set up in: All Bing markets, except for Belgium and China. Serves in: All Bing markets, except for China. You typically use Location Extensions to provide an address and local phone number associated with a local location. Using a Call Extension, you can provide a phone number that is not associated with a particular location, but is appropriate for all locations where your ads display. Call Extensions have the added benefit of allowing you to designate your ads as call only ads. When you select Show just the phone number under Mobile Format your ad headline will be replaced with your phone number when your call extension serves on mobile devices. Instead, your phone number is the only link that a user can click. Clicking on the phone number link will initiate a call to that number and you will be charged up to your bid amount (just as if the user had clicked on a website link). With Call Extensions, you have two options: You can use your own phone number or use a Bing Ads forwarding phone number. When using a forwarding number, we assign a unique phone number that displays in your ad. When a customer calls this number, the call is routed to your business phone number. Our forwarding number allows you to track all calls from this ad, no matter where the call was made from, so that you can analyze the ad performance. Call Extensions can be used together with Location Extensions. When these two features are used at the same time, the phone numbers displayed and the availability of click-to-call depend on the device where the ad is being viewed. To understand what to expect when using these features together, see What happens when I use both Call and Location Extensions?. Serves in: Available in the United States and United Kingdom on all devices. Available in all other Bing markets on smartphones only, except for China. Check out: How do I add a clickable phone number to my ad?. Sitelink Extensions are additional links in your ads that take customers to specific pages on your website. This allows you to promote certain products, services, or sections of your website and take potential customers to exactly the information they were searching for. This can increase both click-through-rate and conversions. To learn how to enable a Sitelink Extension, take a look at How to enable, edit, or delete Sitelink Extensions. For each campaign, you can enter up to 20 sitelinks. Sitelinks can be set at account, campaign and ad group level. Specifying sitelinks at the lower levels will override any associations at the higher levels. You can also add up to two lines of descriptive text under each Sitelink Extension. These enhanced Sitelink Extensions can draw attention to your ad by increasing its size. Only high-quality ads at the top of the search results page will trigger enhanced Sitelink Extensions, so make sure you add descriptions to high performing campaigns, such as your brand term campaigns. 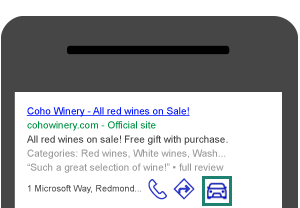 An ad can display 2, 4, or 6 enhanced sitelinks with descriptions, or 4 or 6 sitelinks in a single row without descriptions, which will be determined by Bing. When displaying an ad, Bing Ads determines which links are most relevant to the ad being displayed and includes those with your ad. However, you can influence which links are included. Links that you enter at the top of your list receive higher priority than those lower in the list. Bing Ads will only show Sitelink Extensions in the mainline and only for high quality ads and campaigns. Therefore, make sure to add Sitelink Extensions to your highest performing campaigns. It might take some time for new campaigns to start showing Sitelinks Extensions due to time required to build a history and quality score for the campaign. Add visual elements to your ad with Image Extensions. Providing visual elements to your ads helps them stand out and also gives customers a better idea of what to expect when they click your ad. You can add an Image Extension to your ad at no extra charge - you only pay when your Image Extension link is clicked. Serves in: All Bing markets, except China. 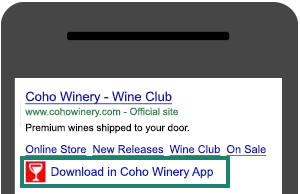 Add an App Extension to your ad to promote your apps across PCs, tablets, and smartphones from your ad. Promoting app installs in your ad increases downloads and usage of your apps, in addition to website visits. Unlike Sitelink Extensions, an App Extension will automatically detect a customer's device and operating system and take them directly to the correct app store. Ability to set up in: All Bing markets. For android apps, we currently only support apps available in the United States Google Play store. Serves in: All Bing markets, except China, Hong Kong, and Taiwan. 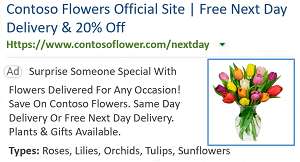 Callout Extensions provide an extra snippet of text that highlights your website’s products or offers. This extension is not clickable and can appear in addition to your ad’s description. Providing additional details about your website can make your ad more relevant to potential customers. Each campaign and ad group can have 20 Callout Extensions associated with it and a minimum of 2 callouts must be associated with the campaign or ad group for the callout to serve. Keep in mind that your ads won’t always show callouts and if they do show callouts, the format it appears may vary. Callout Extensions are free to add to your ad. Potential customers like to know about other customers’ experiences when searching for products or services. Share positive reviews from a reputable third-party source about your website in your ads with a Review Extension. You can paraphrase or use an exact quote from the source. Each campaign and ad group can have 20 Review Extensions associated with it. As with other extensions, the Review Extension won’t always show with your ads. You can add a Review Extension for free and when customers click on it, they’ll be directed to a third-party review source. Give potential customers more context on a specific aspect of your products and services. A campaign or ad group can have 20 Structured Snippet Extensions associated with it. As with other extensions, the Structured Snippet Extension won’t always show with your ads and the format they appear may vary. Structured Snippets are free to add to your ad. Serves in: All Bing markets. Pay-per-click extension that displays your products or services with their corresponding prices to potential customers on PC and mobile devices. An account, campaign, or ad group can have up to 20 Price Extensions. 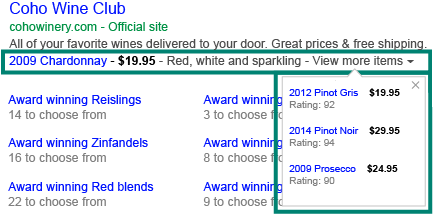 Price Extensions only show on ads listed at the top of the results page, helping to increase your clicks. Keep in mind that though Price Extensions are free to add to your ad, they may not always show for every query. If you'd like to change the order of the items within a Price Extension, you can do so by selecting Edit Price Extensions under the Ad Extensions tab in All Campaigns. All Price Extensions are subject to an editorial review to ensure that the listed prices match the price shown on your landing pages. Learn more about editorial reviews. Serves in: United States, United Kingdom, Canada, France, Germany, and Australia. All remaining markets will be rolled out over the coming weeks. You can now associate extensions at the account level.